Long-lasting all-rounder. An economic Core i7 processor and a dedicated Nvidia GPU topped with a lot of storage and wrapped up in an elegant aluminum casing - this is the recipe for a versatile and high-performance multimedia laptop. But is it enough to justify the ambitious price of almost 1200 Euros (~$1619)? Positive: Superior design; excellent build and premium materials; ergonomic keyboard and comfortable touchpad; touch IPS-display; long battery life; reasonable price. Positive: Metal case; long battery life; good performance. Negative: Poor viewing angles and color quality of the display. Positive: Solid mechanical processing; nice Full HD IPS display. Negative: Weak processor; forced dynamic contrast (can be solved by installing the generic drivers from Intel); sometimes difficult to read labels keys. The configuration is based on Intel Haswell platform, i.e. 2.6GHz Core i5-4200U processor belonging to the group of low-power models, which will certainly affect the autonomy. With 6GB of RAM and a separate NVIDIA GeForce GT 750M with 2GB of RAM, good performance is provided, suitable for business and multimedia applications. A classic 5400RPM SATA with 500GB capacity is used, characterized by usual things regarding the space and the speed. Regarding the autonomy, an average time of usage goes up to 8hrs, which is a great result for 15.6" laptops, so it is no surprise it reminds us to an Ultrabook model. Finally, in period March 18 - April 18, you can buy it for RSD69.990 with the option to pay on 12 installments at the Mercator store during the period of PIKA card campaign. Positive: Excellent workmanship; aluminum case; good performance; great autonomy; favorable price. Negative: Mediocre display. Positive: Thin aluminum body; sleek design; relatively good color of the display. Negative: No optical drive. The Dell Inspiron 15-7537 is designed towards satisfying the increasing demand of thin laptops without compromise on performance. It features a 15.6" screen and is only a little over 2.2 cm thick. With about 2.6 kilograms, it belongs to the bulkier laptops. 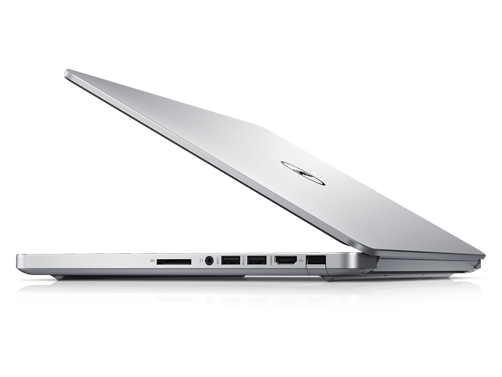 However, what the Dell lacks in mobility, it makes up for with quality, stability and functionality. The exterior design makes it extremely tough while giving off a sleek and high-end feel. The entirety of the chassis is made from solid aluminum and the screen is protected by Corning Gorilla Glass. The 15.6" display comes with a resolution of 1920x1080 pixels. The FullHD display has a pixel density of 141 dpi, giving a great graphical experience. Color and contrast are decent as well. The laptop runs on a 1.8GHz dual core Intel Core i7-5400 processor coupled with 16 GB of RAM and 1 TB of storage space, making it one of the best in terms of hardware specifications. Thanks to the Nvidia GeForce GT 750M graphics card, gaming will definitely not be an issue. The Inspiron 15-7537 is definitely a good laptop. However, the main drawback is its expensive price tag.